We are a non-profit organization who’s goal is to provide warm, wool socks and other warm winter gear to those less fortunate in our community. Over 76,000 Niagara residents live below the poverty line. Our goal is to raise funds and awareness about this growing epidemic in our community, and provide as many socks as possible to those in need in Niagara before the winter season. The socks we donate are 70% wool; they absorb a high amount of moisture, wicking wetness away from the body to ensure dry, warm feet. Wool also keeps its insulating properties even when wet, unlike cotton, and dries twice as fast. Not only are we providing warmth to the less fortunate, we are also creating jobs in our community, through our knitting partner, McMormack Textiles. Socks for Change has donated to over 50 worthy organizations throughout the Niagara Region. We have also donated to over 153 schools throughout the Niagara Region. To date, Socks for Change has donated 20,703 pairs of warm, wool socks. We have also donated 12,595 winter accessories that includes toques, scarves, face masks, headbands, and more. Featured in The St. Catharines Standard: “Socks for Change: West 49 founder Sam Baio puts his heart into warming feet”. Make a Donation Online to Support this Worthy Cause! 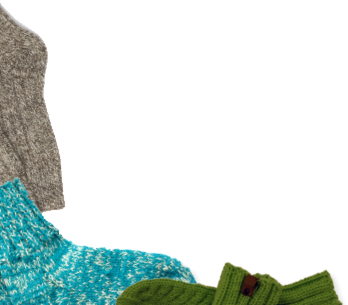 Each $2 Donation Buys 1 Pair of Warm Wool Socks. Make a donation in someone else’s name or as a gift and we will email you a downloadable gift certificate to present. Thank you to all of those who have made a donation in person, or online. We could not have reached our goal without your support. Of course, there are still many in need. You can continue making online donations for yourself, or as a gift. 11,035 people are waiting for affordable housing in Niagara. 1 in 6 Niagara residents are living in poverty. 1 in 3 food bank patrons are children. Each month, many families struggle with the decision of paying for Rent or Food. There are over 25 Shelters in the Niagara Region. If you are making a donation in someone else's name or as a gift, we will email you a downloadable gift certificate to present. I am making a donation as a gift.